Calmness is “a mental and emotional peace of mind, free from worry, stimulation or disruption”. It sounds like nirvana, doesn’t it? In reality, remaining calm is really hard. It is too easy to respond to situations…no matter how big or small…with your first reaction. Your first reaction is not always the best response. You need to work as hard on calmness as you do with your martial arts. If tension rises inside of you, do the opposite of what you are doing to put you in that tense state. Walk away from a stressful situation. Take a few deep breaths and focus on something happy. Force yourself to smile, as it is hard to be stressed with a smile on your face. In class, we purposely put you through physical and mental stress, so you can learn to react correctly and ultimately relax correctly. You must learn calmness, otherwise you will not progress with your training. 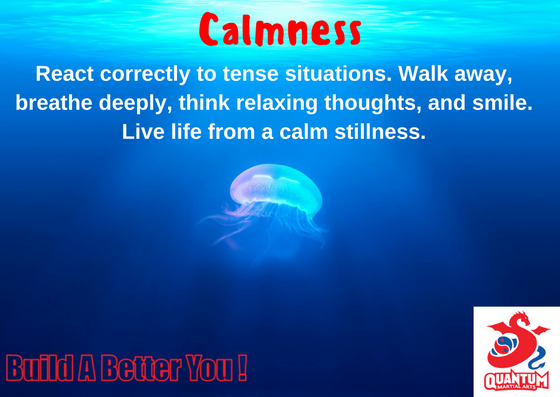 Your challenge is to take the lessons of calmness into your everyday life. For this week, try not to attach any negative thoughts or emotions to a situation. If that is too hard, practice the walking – breathing – smiling tips from above. Slow down, smell the roses and really enjoy every second of this week from your calm state of mind. It helps “Build A Better You!”.